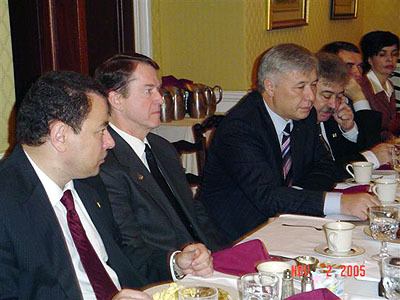 Prime Minister of Ukraine Yuri Yekhanurov (middle right) in a breakfast meeting with members of the Congressional Ukrainian Caucus, co-sponsored by the Ukrainian Congress Committee of America (UCCA). 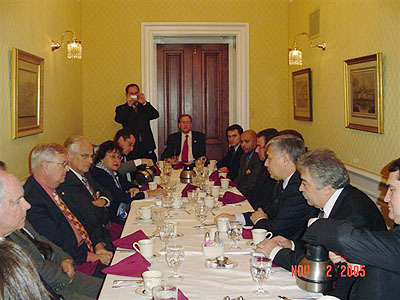 From middle left: Rep. Curt Weldon (R-PA), co-chair of the Congressional Ukrainian Caucus; Rep. Bill Pascrell (D-NJ); Rep. Nita Lowey (D-NY); Rep. Andrew Weiner (D-NY). Seated in the center: Rep. James Langevin (R-RI). Washington, DC (UNIS) - Immediately following a breakfast meeting co-sponsored by the Congressional Ukrainian Caucus and the Ukrainian Congress Committee of America with Ukraine's Prime Minister Yuriy Yekhanurov, Members of Congress held a press conference in the Hall of Columns in the U.S. Capitol, to voice their support for accession to the World Trade Organization (WTO) and the repeal of the Jackson Vanik Amendment for Ukraine. Congressman Curt Weldon (R-PA), vice chairman of the House Armed Services and Homeland Security Committees, opened the press conference stating that Ukraine must be graduated from the Jackson Vanik Amendment immediately. The amendment to the 1974 Trade Act, was instituted to "protect Jews in the former Soviet Union," and is now a "legislative dinosaur", according to the Congressman. Moreover, major Jewish organizations, including the National Council on Soviet Jewry (NCSJ), American Jewish Committee, and B'nai B'rith International to name a few, are not only in agreement of the appeal but have sent their respective letters of support to Congress. Rep. Weldon stated that Congress is in strong support of repealing the amendment, and that "both Republicans and Democrats see no fathomable explanation as to why this amendment still has not been repealed." Weldon also expressed his strong belief that if there was a simple resolution to repeal the amendment, without any whereas clauses, Congress would pass it unanimously. Press Conference following the breakfast meeting. 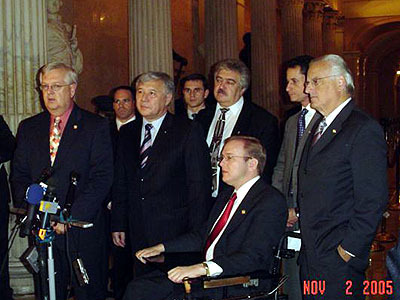 Standing side-by-side with Congressman Weldon (R-PA), the following members voiced their support for Ukraine during the press conference: Bill Pascrell (D-NJ), Joseph Crowley (D-NY), Maurice Hinchey (D-NY), James Langevin (D-RI), and Anthony Weiner (D-NY). In closing remarks, Prime Minister Yekhanurov thanked Congress for their support and hoped that Ukraine would join WTO by the end of this year. In responding to a question posed by a journalist, the Prime Minister voiced his sentiments that Ukraine must be admitted to the WTO before Russia otherwise it would have a slim chance of ever joining the organization.